Editor’s note: The following review is part of Macworld’s GemFest 2011 series. Every day from mid June through July, the Macworld staff will use the Mac Gems blog to briefly cover a favorite free or low-cost program. Visit the Mac Gems homepage for a list of past Mac Gems. 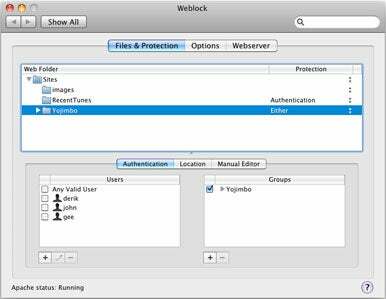 Weblock unlocks your ability to restrict access to files shared on Mac OS X’s built-in Apache server. This allows you to put an authentication dialog on any directory being shared through your Web server or filter based on IP address. This can be enabled by editing some configuration files, but Weblock adds a nice GUI that makes the task quick, easy, and error free. The preference pane consists of three tabs: Files & Protection, Options, and Webserver. The majority of the configuration is done in the Files & Protection pane. Here, you can change options for each directory in the currently chosen web directory (set on the Options pane), which generally corresponds with the root of your webserver (/) and each user directory (/~username/). Although the documentation doesn’t explicitly say so, the users listing is entirely separate from OS X’s authentication. Your username and password won’t work unless you set up a copy of your username and password using Weblock’s facilities. You can set up individual users and groups to help control who can access portions of your webserver. You can also prevent or allow access based upon IP address or hostname. A radio button uses your chosen list as either an allow or disallow filter. The Options tab allows you to choose which Web directory to edit, control sorting and warnings, allow manual editing, and version checking. The Webserver tab allows for some simple control of your webserver, log viewing, and most important, performs WebCheck which is needed to enable Weblock’s settings. Weblock makes unleashing a part of the power in your Apache webserver easy and trouble free. This tool would be a welcome addition to the toolbox of any enterprising Mac OS X user that wants to share files using their Mac but only with certain people. Want to stay up-to-date with the latest Gems? Sign up for the Mac Gems newsletter for a weekly e-mail summary of Gems reviews sent directly to your inbox. You can also follow MacGems on Twitter.